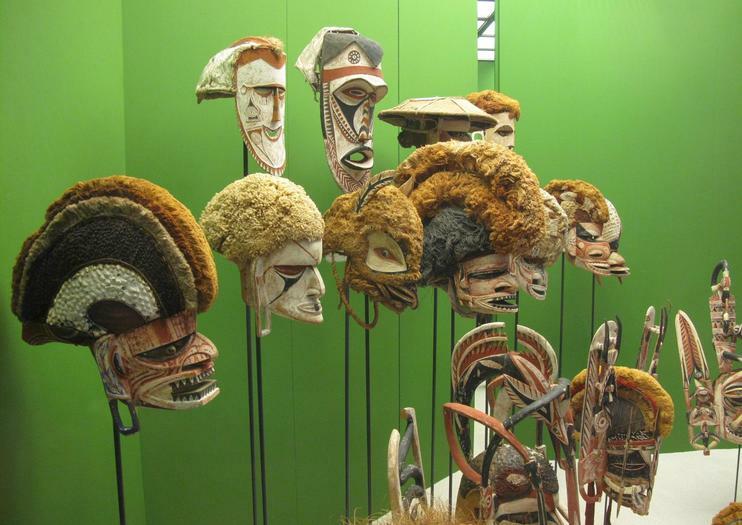 The Museum of Ethnology, or Ethnologisches Museum, houses collections of goods that were created outside of Europe and then brought to Berlin in the 19th and 20th centuries. The collections are divided into geographic regions and arranged thematically to provide insights into non-European cultures and show their diversity; an important part of the museum's mission is to foster global understanding and to go beyond the Eurocentric viewpoint. The “Art of Africa” exhibit teaches visitors about developments in African art history by showing the religious and social significance of sculptures and everyday objects, while “Africa in Berlin” examines the relationship between Africa and Europe. The “American Archeology” exhibit looks at the cultural heritage of pre-Spanish cultures in Central and South America and includes objects that date as far back as 2000 BC. Other exhibits include the South Seas collection with typical boats and houses of the Pacific islands, the “Myth of the Golden Triangle” exhibit which examines ethnic minorities in Southeast Asia, and the “Islamic Worlds” exhibit, looking at different experiences of Muslim cultures. The Museum of Ethnology is located at Lansstraße 8 / Arnimallee 25 in Berlin. To get to it, take the U3 to the Dahlem-Dorf U-bahn station. Opening hours are 10am to 5pm Tuesday through Friday and 11am to 6pm on Saturday and Sunday. Admission costs 8 euros.